Versace Collection traces its origins back to 1991. It achieved immediate success through its combination of formal styling and fashion appeal. The Versace Collection lines offer a wide choice of clothes and accessories, of indisputable quality and strong fashion content that possess their individual DNA but always relate to that of the Versace Group. Versace Collection took a 166 sqm area. The Bluemarine brand was established in 1977 by Anna Molinari and her husband, Gianpaolo Tarabini in Capri, Italy. The first Blumarine boutique was opened in 1990, and to date the brand has opened over 50 stores worldwide, while Blumarine items retail in over 1,000 stores. This brand occupies the area of 168 sqm. Both brands are available within the so-called “Red Carpet alley” which is home solely to the best Russian and international high-end fashion stores. Other brands which will be present in “Red Carpet alley” include: Baldessarini, Dirk Bikkembergs, Bea Yuk Mui, P.A.R.O.S.H, Doucal’s, Moreschi, Zanotti and Luca di Marco. – Versace and Bluemarine are a valuable addition to the “Red Carpet alley”, our new exciting concept, created especially for FASHION HOUSE Outlet Centre Moscow after analysis of the local market – said Brendon O’Reilly, Managing Director of FASHION HOUSE Group. – This part enjoys big interest from both customers and business partners and further leases are under negotiations. I have no doubt it will successfully distinguish our offer in the market – he added. 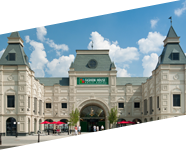 Opened in June 2013, FASHION HOUSE Outlet Centre Moscow offers customers top quality international and domestic brands available all year round for 30%-70% less than original prices. The new tenants joined a long list of luxury, designer and high street brands including: Tommy Hilfiger Adidas, Reebok, US Polo, Tom Tailor, Benetton, Nike, Puma, Lacoste, Cacharel, Carlo Pazolini, Tru Trussardi, Samsonite, Salomon, Reserved, Mohito and others. 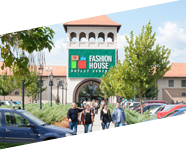 FASHION HOUSE Group (FHGR) is a leading player in the European outlet sector and the largest developer/operator in the CEE and Russian markets, with a proven track record of opening up and dominating the outlet sector in emerging markets. FHGR has delivered and currently manages 5 successful FASHION HOUSE Outlet Centres in Poland, Romania and Russia of a total lettable area of almost 100,000 sqm and is developing a new outlet scheme in St Petersburg. 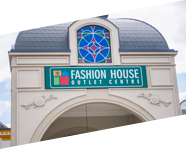 FASHION HOUSE Group specializes in both development and management of outlet centres. 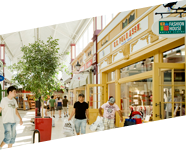 It offers an outlet-dedicated, premium quality, experienced team of experts in the fields of outlet centre design, development, finance, leasing, operation and management. Consequently, FHGR has built up a notable following of world-famous branded retail tenants. FASHION HOUSE Group is part of Liebrecht & wooD Group, a European real estate development company established in 1991, which for over twenty years now has been active in the biggest markets in the CEE region – Poland, Romania and currently also Russia.